We are big fans of Austrian director Michael Haneke here on Wonderful Cinema. We have already reviewed Funny Games (1997) and Caché (2005). Now we turn our attention to his latest – an exceptional film. Amour a.k.a. Love is a beautifully crafted piece of art which is so still and yet so riveting at the same time. The film recounts a very sad story with such grace that by the end of the telling you are left feeling fulfilled rather than in emotional tatters, warm in the glow of acknowledgement of having just watched something very special. Pedigree acting from Jean-Louis Trintignant and Emmanuelle Riva, and understated direction from Haneke raises his self-penned screenplay to soaring heights. Internationally-acclaimed French classical pianist Alexandre Tharaud makes an appearance as an ex-pupil of the retired music-teaching duo. You can find more information on this French-language movie on Wikipedia and IMDb. As always, we recommend you don’t ruin any surprises by reading spoilers or watching trailers. However, we accept that there are those who like to read the last page of the novel first! You’ve inspired me to watch this film. We (partner and I) have been watching more French films recently. Loved Boy with a Bicycle last year. Kristen Scott Thomas convincingly pops up in a few too. I do like her exploration of characters. Thanks. Likewise, it’s definitely one of the most memorable pieces to emerge from Haneke’s “cold, objective” filmography. Nice review. Thank you for the follow…I have been scrolling through your blog and I love it! I will definitely be using some of your film recommendations as soon as I am through with finals! Definitely one of the most touching films I’ve ever seen. I couldn’t stop thinking about the storyline and characters for days afterwards. I missed a beat when Riva has the first episode of forgetfulness. It was stunning. I kept thinking about how Jean-Louis tries to cope with the tragedy at his frail age. It is so realistically, sympathetically depicted. A great film. I have not had the privilege of viewing “Funny Games” & “Cache” and don’t think I ever will here in India. I loved this movie. Made me think about it for days! Good choice! The thing is. 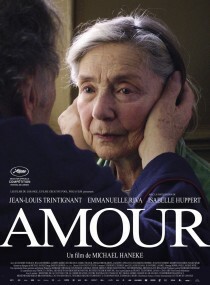 There’s no doubting Amour is a beautifully crafted film, both aesthetically and in it’s symbolism and depth. But, I didn’t find it a pleasant experience. It mostly just harrowed me. I’ve allways been a great fan of Haneke, but I must say that “Love” is one of his biggest success. The scenario is brilliant, the actors direction outstanding, Darius Khojandi’s lightening is perfect… A somptuous masterpiece which has really well deserved its golden palm at last year’s Cannes Festival And all the other prices it has won. I loved Amour, and Cache, and White Ribbon. Haneke is one of the greatest no doubt. I want so much to see this film! Thanks for reminding me and for stopping by my blog, too! Hi, thanks for stopping by my blog. Nice to see someone else taking an interest in non-English-language films. If you get a chance to check out any Russian releases, let me know how you get on! We’re having a bit of a blockbuster year, with Legenda #17 (links to two of my items about that film at http://andyinrussia.wordpress.com/2013/05/15/contemporary-russian-cinema/) and an upcoming release about Gagarin’s life. There’s a slight sense that Russian cinema is running around rebuilding Russian national pride, but it’s interesting to see how films here are starting to break out of a rather rarified arthouse box without (necessarily) turning into trashy rom-com stuff (although yes, we have plenty of those as well). Best of luck with the site! In my opinion this along with Kim-Ki Duk’s “Pieta” were the two best films of 2012. I hadn’t heard of Pieta. That sounds very interesting! Una obra maestra hecha con corazón (y con cerebro); araña las emociones como “Caché” y arrasa el alma como “Código desconocido”, pero esta película es especial en su genial filmografía. A masterpiece made with heart (and brain); spider emotions as “Cache” and destroys the soul as “Code Unknown”, but this film is special in his great films.